There has been some knitting, but so much more gardening. So maybe we will start with that. 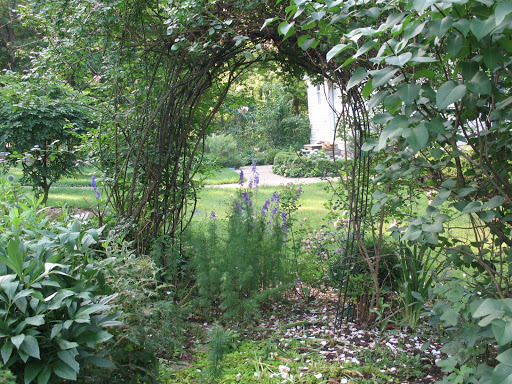 I love garden blogs that show the long shots of the garden not just close ups of the pretty flowers. I am always curious about the design of the gardens. I am not particularly happy with the design right now. Everything is just green. 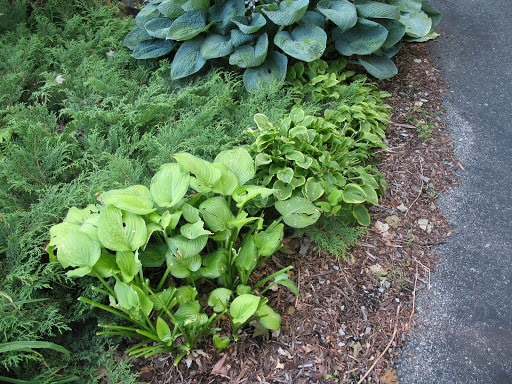 I know as a gardener I am supposed to be interested in the textures and foliage. Somehow that makes me a more sophisticated gardener, but sometimes I just want the flower shots. This is the garden down by the pool which I planned to be very colorful for the summer months when we enjoy spending time swimming. This is not very successful, just green, green, green. Not what I envisioned. 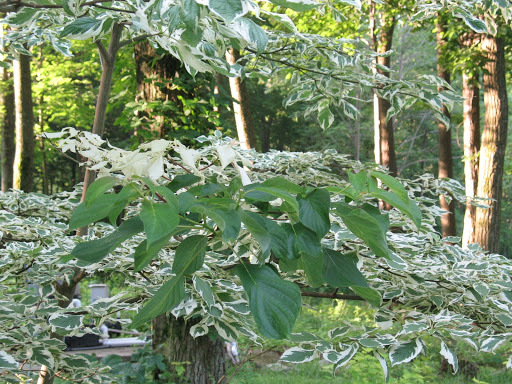 This is a beautiful Pagoda dogwood that has one branch reverting to just green. Margaret talked about this issue at awaytogarden. I cut this branch out after I took the picture. 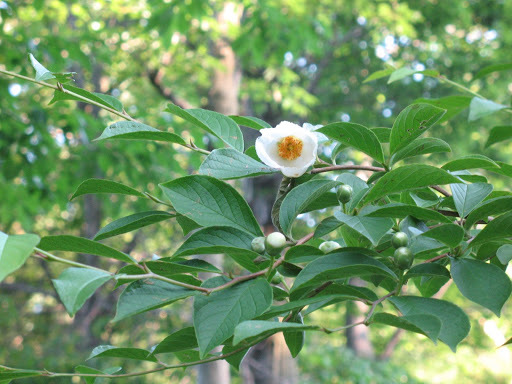 The stewartia is in bloom. I love this small, understory tree. No fragrance, but 4 seasons of interest. The bark is amazing. until you get up close…We have 3 does wandering around the farm. 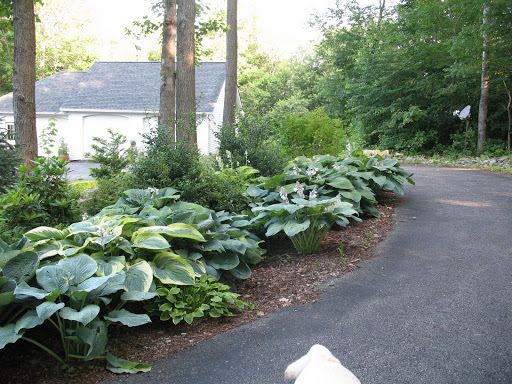 One has a set of twin fawns, who while very cute are munching away on a few of my favorites, these hostas included. You be the judge. I feel like I should dig everything up, move plants and rethink the whole design. This may have something to do with being on vacation when the spring show was on and I missed the whole thing; peonies, roses, geraniums, dianthus, nepetas, sweet peas. Most of my favorites and I missed them all. 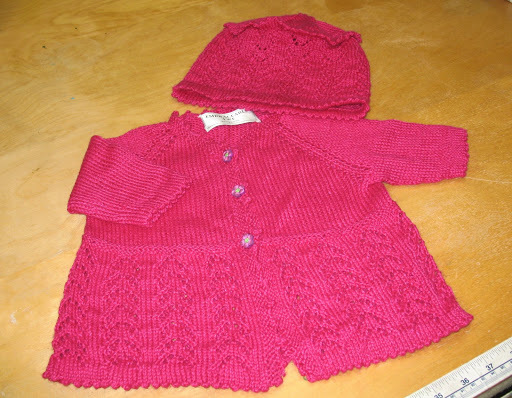 I finished the little Blue Sky Alpaca and Silk Helena sweater and hat for my friend’s new baby girl. I am very happy with how it turned out and even have a skein left to play with. This yarn is dreamy. Thought you might like to see the adorable buttons too. I purchased this yarn and the buttons at Sheep to Shore on Nantucket, MA, my hometown. 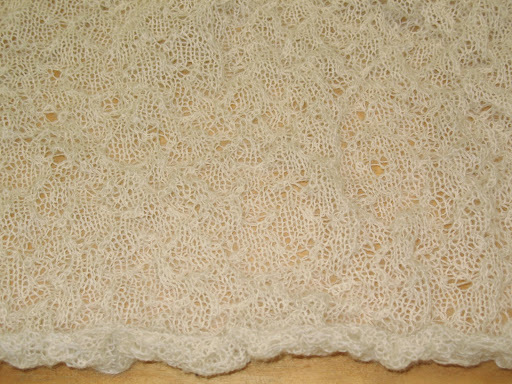 I am also knitting a lace shawl that I hope will be used as a christening blanket for the first grand child of a good friend. The yarn is Alpaca and it feels like buttah. I was inspired the christening blanket by Franklin Habit knit for his niece. The baby is due in August so I need to get cracking on this. 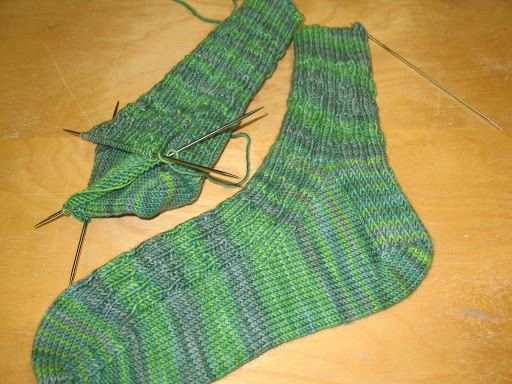 Ann Hanson’s Tesserae socks out of the Blue Moon Fiber Arts medium weight sock yarn on size 1 needles. They should be very warm as they are very compacted. 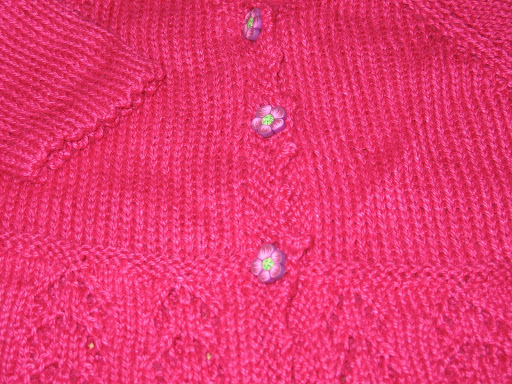 Another baby sweater for the first child of one of my daughter’s favorite babysitters when they were wee tikes. We know she is having a boy. Mission Falls Cotton , my own design. Now I must find just the perfect buttons. Also have to finish a Fair Isle vest for a particular someone who will be home from Venice in 3 weeks. Luckily the weather will be too hot for her to wear it right away. Now I have a question for you all. This Sunday 2 of my friends and I will be touring gardens of Pittsburgh and Ligonier on the Pittsburgh Botanical Open Garden Tour. I know I will be taking oodles of pictures. 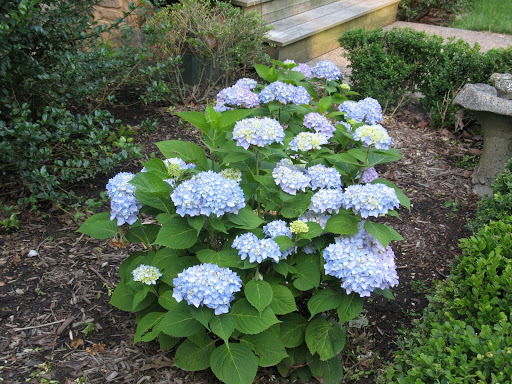 What is the correct etiquette about sharing other people’s garden pictures on my blog? I am thinking that is not too kosher but not sure. I am sure some of them will be amazing and I would love to share with you all but don’t think it is proper. What do you think???? ← Let there be Berries. I love how lush and green your garden looks now. Lucky you, to have does and fawns wandering around, even if they do snack on the scenery. 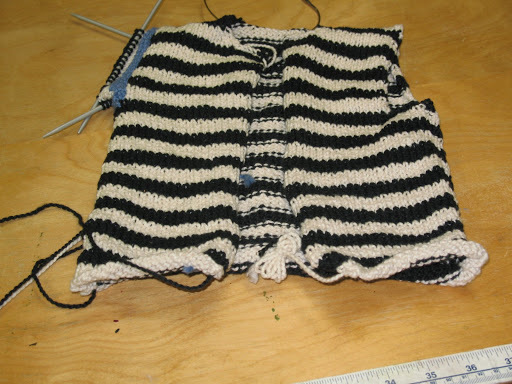 I am always amazed how much knitting you get done – I think I’ve only finished 2.5 socks in the last 6 weeks (that’s individual socks, not pairs…).I really love that little black & white striped sweater. What color are you thinking of for buttons? It might look cute with big crayon-colored ones. Red? or Blue?My two cents’ worth on your question of photos of the garden tour is that the gardeners are knowingly opening their yards to the public, so that anyone could view or photograph them. If you share photos on your blog it’s not much different than if any of us had been there. It would be different if you were, say, hanging over someone’s back fence taking snaps without their knowledge! These folks WANT lots of people to see their gardens. Just my not-so-humble opinion. 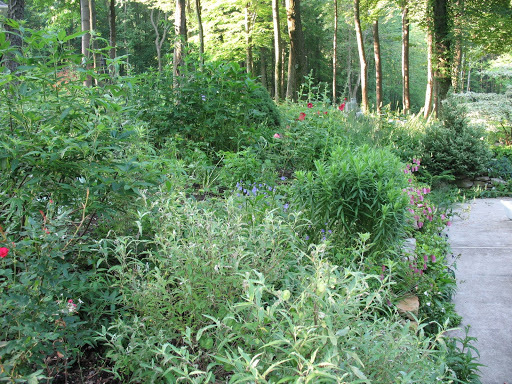 I think anyone would be honored to have their garden pictured on the web. Just ask and give credit to the gardener! Love your green borders and the textures are interesting. I also like the long shots but they are harder to compose I find.